"The First and Last Mission of Suicide Zero"
Our story takes place several years ago. 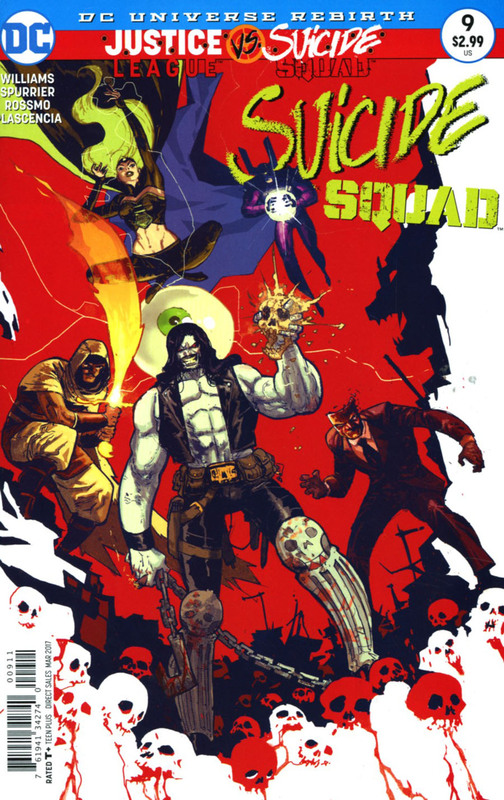 Amanda Waller has gathered together the first Suicide Squad consisting of Rustam, Emerald Empress, Lobo, Johnny Sorrow, Dr Polaris and Cyclotron. She sends them on a mission to stop a foreign dictators own Super Powered team, before he uses them against the rest of the world, should he feel like it. The mission goes well, until Cyclotron persuades the rest of the Squad to use the "God Engine" that powers the foreign team, to take over the world and be free of Amanda Waller's control. Rustam and Lobo oppose this plan, and Amanda Waller who is listening in on the comms, orders Lobo to kill Cyclotron. He does so, causing a massive explosion, as Cyclotron was a human bomb. In the end, it appears that Dr Polaris was able to shield the Squad from the explosion. Waller orders the Squad be taken into custody, as they all lie there comatose. She then re strategizes and decides to put together a new Suicide Squad... One she can control via Nuero-Bombs. Story - 4: Just like Justice League #12, this issue is meant to give us a back story on one of the main players in the Justice League vs. Suicide Squad crossover. Unlike the Justice League issue, this issue doesn't go too far into Amanda Waller's back story, but rather the origins of her first Squad. Cunning and manipulative as ever, Amanda Waller walks a thin line between a good and evil. Defeat is not an option for her. What really got me was how she decided to lock Rustam up with the rest at the end of the day, just because he knew too much. It is no wonder he hates her so much and wants her dead. Lobo I have always liked, but do not like this new power-set of his, nor the fact that he is now a hired gun instead of a bounty hunter. Rustam is fast becoming a favorite character of mine. I hope he make it through this crossover. A good flash back story, that fleshes out the finer details of the event. Art - 5: I absolutely love the fact that DC is showcasing a lot of new talent. Riley Rossmo's art was fantastic this issue. I love the cartoonish roughness he bought to the table. It reminds me a lot of Jock's art style. His rendition of Lobo was my favorite. He bought back the 90's look and charm to him. Noteworthy panels are the ones that feature Amanda Waller. Coupled with the coloring, they really standout and show all sides to her character. I really want to see more from him in the near future. Cover Art - 4: I like this cover a lot. The colors against the white background make it pop. The only downside is the composition. It just feels a little off. Variant Cover Art - 5: I love Bermajo's art. This is a classic Lobo image. One worthy to be a pin up or even a poster.